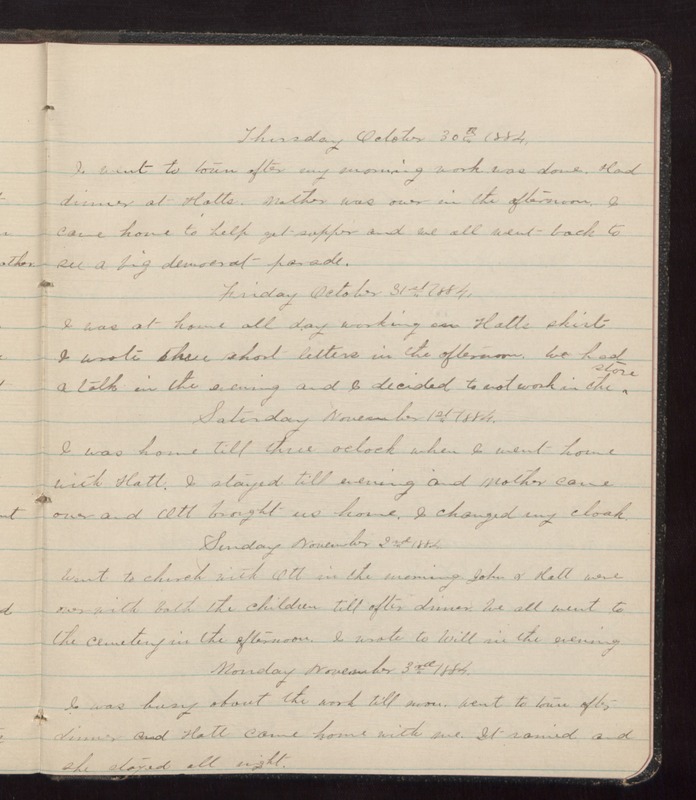 Thursday October 30th 1884. I went to town after my morning work was done. Had dinner at Hatts. Mother was over the afternoon. I came home to help get supper and we all went back to see a big democrat parade. Friday October 31st 1884. I was at home all day working on Hatts skirt I wrote three short letters in the afternoon. We had a talk in the evening and I decided to not work in the store. Saturday November 1st 1884. I was home till three oclock when I went home with Hatt. I stayed till evening and Mother came over and Ott brought us home. I changed my cloak. Sunday November 2nd 1884. Went to church with Ott in the morning. John & Hatt were over with both the children till after dinner. We all went to the cemetery in the afternoon. I wrote to Will in the evening. Monday November 3rd 1884. I was busy about the work till noon. Went to town after dinner and Hatt came home with me. It rained and she stayed all night.